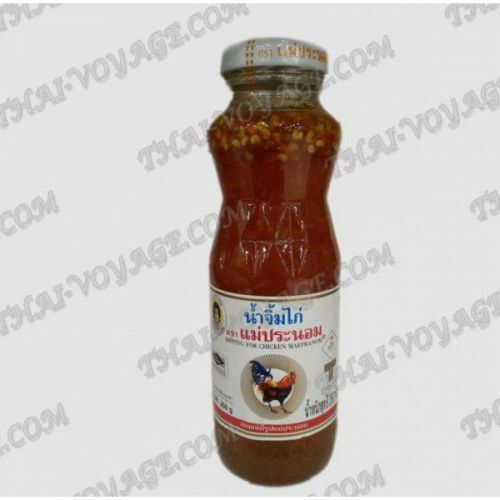 Thai sweet chili sauce for chicken can be used as a basis for the preparation of various dishes. The most popular in Thailand and insanely delicious sauce "sweet chili" from Maepranom. The sauce is moderately spicy and sweet. Perfect for chicken. Sauce Maepranom can be used for other types of meat, poultry, fish, seafood and vegetables, and rice. For fried chicken, chicken grill, fried shrimp, meat and fish patties, spring rolls, sausages, rice, pilaf and many other dishes. The sweet chili sauce is very tasty as a condiment to the finished dish. Also Maepranom gravy can be used as a basis for the preparation of various dishes. Ingredients: sugar 40%, red Chile 20%, garlic 20%, vinegar 15%, salt 5%. Contains no preservatives or artificial colors. Only natural ingredients! Shelf life 1 year. Store in a cool, dry place. Shake before use. After opening the sauce, keep the lid closed in the refrigerator for up to 6 months. FDA certificate 10-1-00718-1-0031.